Meanwhile, grind poppy seeds in a mortar and pestle with a little water or milk and set aside. When bobalki are cooled, break the balls apart from each other and place in a colander. Pour just enough boiling water over bobalki to soften but not turn them into mush. Drain well. 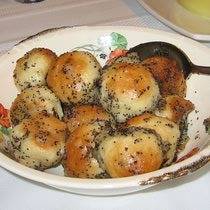 Pour warm honey and ground poppy seeds over all. Stir lightly and serve immediately. Savory Bobalki: Instead of using poppy seeds and honey, rinse a 1-pound can sauerkraut and squeeze out all moisture. Saute with chopped onion in butter (or oil if following a strict fast). Mix with bobalki and season with salt and pepper to taste.